Fans of Grand Theft Auto will soon be able to collect a lavish three-book set detailing the game-maker's entire history, but it won't come cheap. Thanks to its incredibly successful Grand Theft Auto series, there's no question that Rockstar is one of the most influential developers in the business today. It's also garnered its fair share of die-hard fans - and now those fans can get their hands on an astounding collection of Rockstar history ... as long as they've got a few hundred dollars lying around, that is. 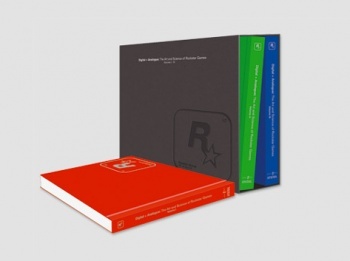 Digital + Analogue: The Art and Science of Rockstar Games is a three-volume set published by German art book house Steidl, and will undoubtedly be one of the crown jewels in the collection of any fanatic GTA lover. The three books feature "original illustrations, wireframes, production stills, product shots, ads, inspiration and candids of the company's games" as well as additional video/multimedia content on an included DVD. Given that the hugely detailed Rockstar environments (see also: GTA: San Andreas, Vice City, Red Dead Redemption) and colorful cast of characters are widely renowned as some of the best in the industry, I can think of few other developers who would better fit such a book collection. Does this sound incredible? You bet. Will it punch you in your wallet? Definitely. As nifty as Digital + Analogue seems, it won't come cheap: You'll need to plunk down $450.00 / €352.00 / Â£310.00 if you're determined to get your hands on this baby. That seems a bit steep to me, but then again I did just spend $180 on a mecha model, so clearly I'm not the best judge of price. Also, Amazon UK has it listed for Â£75, but that may be an error. Price aside, this definitely looks like something worth spending money on if you love videogames and have the dough to burn.